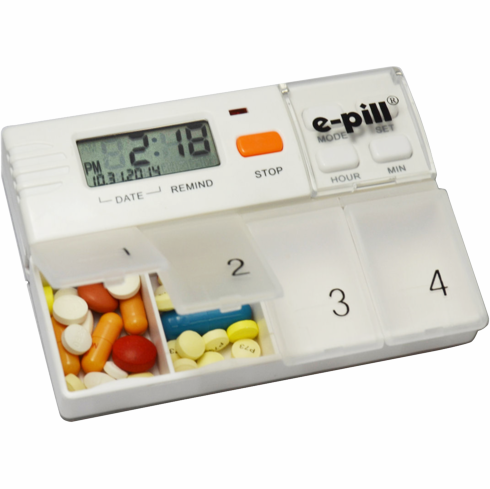 The e-pill MedGlider Daily Pill Organizer is a combination Daily Pill Timer and Pill Box. 4 Daily Pill Alarms Automatically Reset every day. The pillbox slides on and off easily to allow for fast filling. "I just love it, haven't missed taking a pill at the proper time since I got it!" R.L. Alarm Duration: 3 Minutes with Missed Pill Indicator. 10 seconds On - 10 seconds Off. Size: 4 1/4" x 3 1/4" x 1"